In this tutorial we are going to create and train Iris model using ANNdotNET v1.0. ANNdotNET is windows desktop application for creating and training deep learning models. 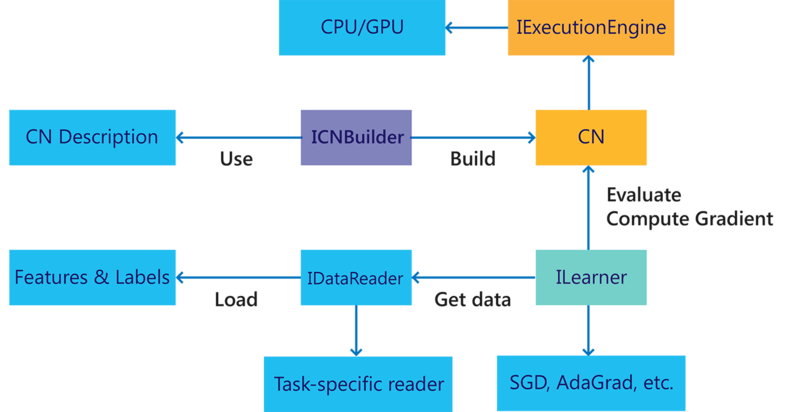 It uses Microsoft CNTK library as Machine Learning Engine, MLE, which makes this project a high performance and industry capable application for deep learning. The project is hosted at http://github.com/bhrnjica/anndotnet. ANNdotNET CMD provides high level of API for such implementation, all ml configurations developed with GUI tool,can be handled with CMD tool and vice versa. There are dozens of pre-calculated projects included in the installer which can be opened from the Start page as well as from CMD tool. The annprojects are based on famous datasets from several categories: regression, binary and multi class classification problems, image classifications, times series, etc. In this quick tutorial it 8 steps will be described how to implement iris ml model in ANNdotNET v1.0. 1. Step: Download the data set file from https://archive.ics.uci.edu/ml/machine-learning-databases/iris/iris.data and place it on desktop. 2. Step: Open ANNdotNET GUI Tool, Press New command, and save empty project on disk by entering project name as IrisProject. 3. Step: Select Data Command from Model Preparation ribbon group, Click File button from Import experimental data dialog and select the recently downloaded file. Check Comma check box and press Import Data button. Dense layer and press Add button twice. Setup layer parameters as image shows below. Also for the learning parameters setup values as shown on the image below. At the end press Run button, and switch to Training tab page. Saving good model during training. 7. Steps: Once the model is trained you can evaluate model by selecting Evaluate tab page. Depending on the model type (regression, binary or multi class classification) appropriate information is shown. Since this is multi class classification model, the performance parameters for multi class classification are shown. On the left side parameters and chart are related to training data set, while the right side is related to validation data set. 8. Steps: For further analysis you can export model to Excel, or CSV or CNTK model. Also you can save the project which can later be opened and retrained again. Note: Currently ANNdotNET is in release candidate, and feature complete verions. In the next few weeks the application will be stabilized and released. CNTK is Microsoft’s deep learning tool for training very large and complex neural network models. However, you can use CNTK for various other purposes. In some of the previous posts we have seen how to use CNTK to perform matrix multiplication, in order to calculate descriptive statistics parameters on data set. In this blog post we are going to implement simple linear regression model, LR. The model contains only one neuron. The model also contains bias parameters, so in total the linear regression has only two parameters: w and b. The reason why we use the CNTK to solve such a simple task is very straightforward. Learning on simple models like this one, we can see how the CNTK library works, and see some of not-so-trivial actions in CNTK. The model shown above can be easily extend to logistic regression model, by adding activation function. Besides the linear regression which represent the neural network configuration without activation function, the Logistic Regression is the simplest neural network configuration which includes activation function. In case you want to see more info about how to create Logistic Regression with CNTK, you can see this official demo example. We already know that the linear regression parameters for presented data set are: and , so we want to engage the CNTK library in order to get those values, or at least parameter values which are very close to them. 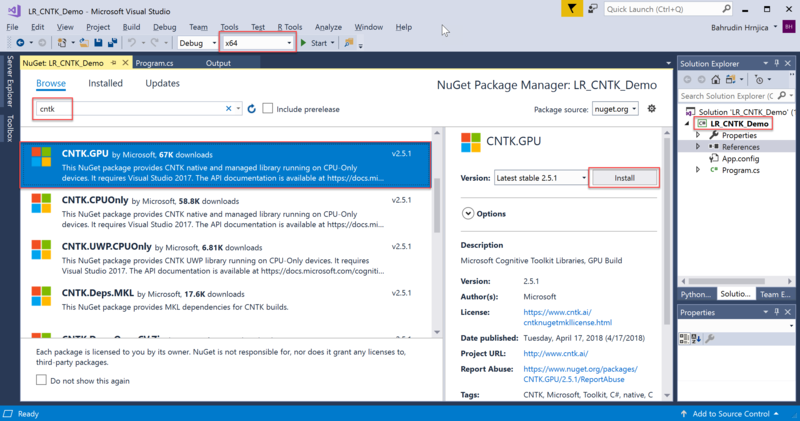 Step 1: Create C# Console application in Visual Studio, change the current architecture to , and add the latest “CNTK.GPU “ NuGet package in the solution. The following image shows those action performed in Visual Studio. Step 2: Start writing code by adding two variables: – feature, and label . Once the variables are defined, start with defining the training data set by creating batch. The following code snippet shows how to create variables and batch, as well as how to start writing CNTK based C# code. In the previous code, we have seen how to extract parameters from the model. Once we have parameters, we can change its values, or just print those values for the further analysis. Step 4: Create Trainer, which will be used to train network parameters w and b. The following code snippet shows implementation of Trainer method. Step 5: Training process: Once the variables, data set, network model and trainer are defined, the training process can be started. As can be seen, in just 200 iterations, regression parameters got the values we almost expected , and . Since the training process is different than classic regression parameter determination, we cannot get exact values. In order to estimate regression parameters, the neural network uses iteration methods called Stochastic Gradient Decadent, SGD. On the other hand, classic regression uses regression analysis procedures by minimizing the least square error, and solve system equations where unknowns are b and w.
Hope this blog post can provide enough information to start with CNTK C# and Machine Learning. Source code for this blog post can be downloaded here. In the previous post, we have seen how to calculate some of basis parameters of descriptive statistics, as well as how to normalize data by calculating mean and standard deviation. In this blog post we are going to implement data normalization as regular neural network layer, which can simplify the training process and data preparation. Simple said, data normalization is set of tasks which transform values of any feature in a data set into predefined number range. Usually this range is [-1,1] , [0,1] or some other specific ranges. Data normalization plays very important role in ML, since it can dramatically improve the training process, and simplify settings of network parameters. – Gauss Normalization or Z score normalization, which transforms the value in such a way that the average value is zero, and std is 1. Beside those types there are plenty of other methods which can be used. Usually those two are used when the size of the data set is known, otherwise we should use some of the other methods, like log scaling, dividing every value with some constant, etc. But why data need to be normalized? This is essential question in ML, and the simplest answer is to provide the equal influence to all features to change the output label. More about data normalization and scaling can be found on this link. As can be observed, the Normalization layer is placed between input and first hidden layer. Also the Normalization layer contains the same neurons as input layer and produced the output with the same dimension as the input layer. calculate average and standard deviation in training data set as well find maximum and minimum value of each feature. this must be done prior to neural network model creation, since we need those values in the normalization layer. within network model creation, the normalization layer should be define after input layer is defined. Before network creation, we should prepare mean and standard deviation parameters which will be used in the Normalization layer as constants. Hopefully, the CNTK has the static method in the Minibatch source class for this purpose “MinibatchSource.ComputeInputPerDimMeansAndInvStdDevs”. The method takes the whole training data set defined in the minibatch and calculate the parameters. Now that we have average and std values for each feature, we can create network with normalization layer. In this example we define simple feed forward NN with 1 input, 1 normalization, 1 hidden and 1 output layer. The whole source code about this example is listed below. The example show how to normalize input feature for Iris famous data set. Notice that when using such way of data normalization, we don’t need to handle normalization for validation or testing data sets, because data normalization is part of the network model. The data set files used in the example can be downloaded from here, and full source code demo from here. As you probably know CNTK is Microsoft Cognitive Toolkit for deep learning. It is open source library which is used by various Microsoft products. Also the CNTK is powerful library for developing custom ML solutions from various fields with different platforms and languages. What is also so powerful in the CNTK is the way of the implementation. In fact the library is implemented as series of computation graphs, which is fully elaborated into the sequence of steps performed in a deep neural network training. Each CNTK compute graph is created with set of nodes where each node represents numerical (mathematical) operation. The edges between nodes in the graph represent data flow between operations. Such a representation allows CNTK to schedule computation on the underlying hardware GPU or CPU. The CNTK can dynamically analyze the graphs in order to to optimize both latency and efficient use of resources. The most powerful part of this is the fact thet the CNTK can calculate derivation of any constructed set of operations, which can be used for efficient learning process of the network parameters. The flowing image shows the core architecture of the CNTK. On the other hand, any operation can be executed on CPU or GPU with minimal code changes. In fact we can implement method which can automatically takes GPU computation if available. The CNTK is the first .NET library which provide .NET developers to develop GPU aware .NET applications. What this exactly mean is that with this powerful library you can develop complex math computation directly to GPU in .NET using C#, which currently is not possible when using standard .NET library. For this blog post I will show how to calculate some of basic statistics operations on data set. If you want to play with CNTK and math calculation you need some knowledge from Calculus, as well as vectors, matrix and tensors. Also in CNTK any operation is performed as matrix operation, which may simplify the calculation process for you. In standard way, you have to deal with multidimensional arrays during calculations. As my knowledge currently there is no .NET library which can perform math operation on GPU, which constrains the .NET platform for implementation of high performance applications. If we want to compute average value, and standard deviation for each column, we can do that with CNTK very easy way. Once we compute those values we can used them for normalizing the data set by computing standard score (Gauss Standardization). where X- is column values, – column mean, and – standard deviation of the column. For this example we are going to perform three statistic operations,and the CNTK automatically provides us with ability to compute those values on GPU. This is very important in case you have data set with millions of rows, and computation can be performed in few milliseconds. 2. Define Value and Variable objects. 5. Retrieve the result of the calculation and show the result.